As the snow melts around Longyearbyen, the incredible geological makeup of the Svalbard archipelago can be observed and the mountain peaks, valleys and open tundra become accessible with a local guide. Join a boat excursion on the Isfjord to witness the drifting sea ice, glacial cliffs and to explore the tidal shores rich in fossils. It is also possible to visit the abandoned mining settlement of Pyramiden and the Russian settlement of Barentsburg. 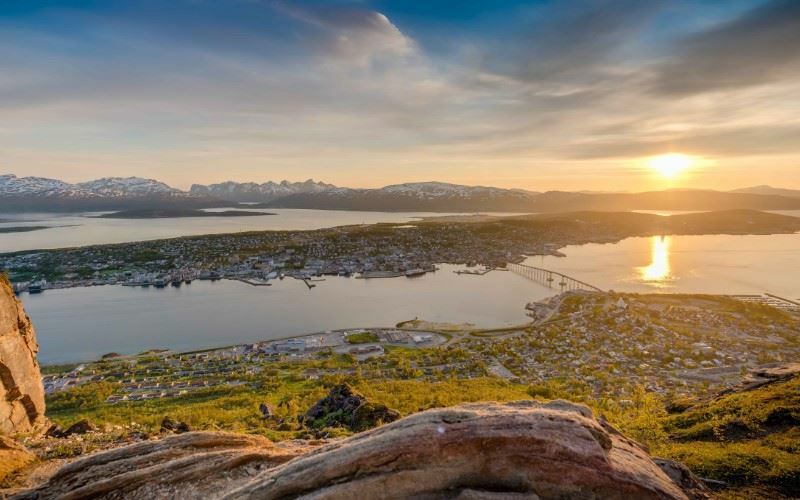 Combining the high Arctic with the university city of Tromsø, this 7-night itinerary allows you to explore and experience two of the highlights of Northern Norway. Cultural interactions, majestic scenery, delicious local cuisine and memorable experiences are guaranteed. On arrival at Longyearbyen airport, self transfer to the Trapper’s Hotel in the centre of the town. Overnight at the Funken Lodge, Longyearbyen. Guided tour of Longyearbyen The archipelago of Svalbard is like nowhere else on earth, and it is only with a guided tour that you will truly understand the islands - their geology, history and modern-day life. This morning, we have included a 3-hour minibus excursion of the capital which will visit the site of the Global Seed Vault and pass by the mines of Adventdalen and Longyearbyen church. Afternoon and evening at leisure. Boat excursion to Pyramiden and Nordenskiold Glacier After breakfast, you will be met by a local guide and transferred to the waterfront in Longyearbyen for your full day boat excursion to Pyramiden, an abandoned Russian mining settlement. Your cruise will leisurely sail inland along the Isfjord and Billefjord. Wrap up warm, and take your seat on the deck to enjoy the passing scenery - bird cliffs, drifting sea ice and the vibrant blue glacier of Nordenskiold. Nothing can prepare you for your first sighting of a glacier and the wall of ice which stretches upwards in front of your eyes. Listen carefully and you will hear it groaning against the mountainside. At Pyramiden you will have time to explore the ghost town, last inhabited in 1998. The streets and buildings stand, as they once did, slowly decomposing. It feels like a film set but, in fact it is real life. Fossil hunting on foot Today, enjoy a 3-hour hiking tour on the moraine of the Longyear Glacier. Away from the town, it is unlikely you will see any other person except for your companions. The nature is silent, untouched and covered by gravel, small lichen, miniature grass and arctic fl owers. It is also possible to uncover fossils amongst the landscape, and if you find a plant fossil you can take it home as a souvenir. On arrival in the largest city in Northern Norway, you will be transferred to the Clarion Hotel The Edge. Overnight at the Clarion Hotel Edge, Tromso. Day at leisure in Tromsø. Opportunity to explore this evocative city and its museums and attractions. We would highly recommend taking the cable car towards the summit of Mount Storsteinen (421m) which affords a panoramic view over the city and its surrounding archipelago. Alternatively, hire a car or join a minibus tour and explore the breathtaking landscape of the region. Lofty mountains, traditional fishing villages, vibrant coastal communities, green fertile lands and white sand beaches are yours to discover. Free time in Tromsø. Why not join one of the many excursions which depart from the city. From boat tours and fishing, kayaking and hiking trips to glacial tours, there is something for everyone. Evening at leisure in Tromsø. If you are in the city between 1 June - 15 August, we would recommend that you join the Midnight Sun concert at the Arctic Cathedral. After breakfast, you will be transferred to Tromsø Vaernes airport for your return flight to the UK. Funken Lodge (formerly the Spitsbergen Hotel) reopened in 2017 after a complete refurbishment. It offers accommodation of the highest standard and some of the best views in Longyearbyen, from its elevated position at the back of the town. Funken Lodge (formerly the Spitsbergen Hotel) reopened in 2017 after a complete refurbishment. It offers accommodation of the highest standard and some of the best views in Longyearbyen, from its elevated position at the back of the town. For us, Funken Lodge is set apart from other hotel offerings in the city due to its rich heritage and connection with the Spitsbergen Coal Company; a history that, even today, can be felt and experienced. Yes, the property is modern but the pictures and artefacts which line the public areas and guest rooms ensure that its 70 year story will never be forgotten. The Clarion Hotel The Edge one of the newest hotels in Tromsø and occupies a privileged and panoramic position in the heart of the city. Inside, modern, neutral decoration has been used throughout the property to create a bright ambience and large windows allow the surrounding environment to flood in. The city’s museums, shops, restaurants, bars and the Hurtigruten terminal are all within a short stroll of the property. Perfect for a short break all year round or as part of a longer multi-centre itinerary. Sky Bar with terrace and excellent views of Tromsø and the surrounding region. Open Friday and Sunday all year.